Little precious do I know about figs. I’ve never had my own fig tree, only looked enviously from a window at a neighbour’s tree and at the fruit going begging. Sometimes, when the neighbours were away, I made raids … but I soon gave that up because the birds had got there first. Must be a few tricks to growing good figs, then. 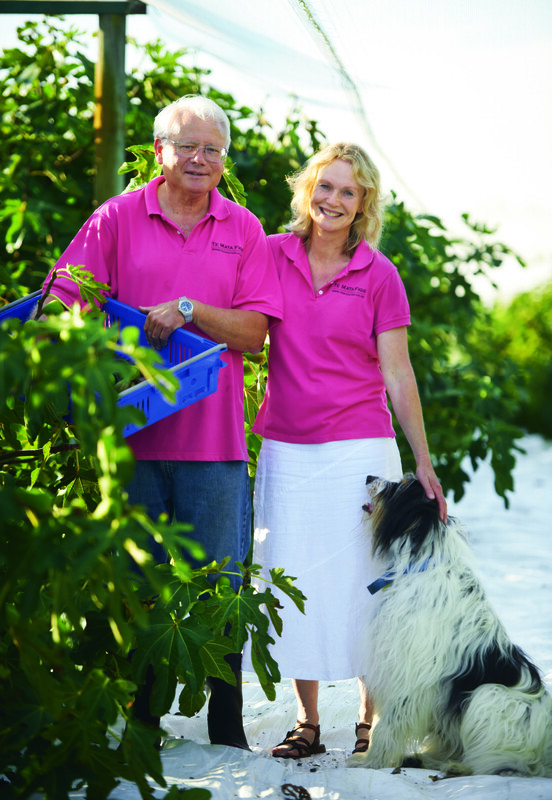 I met up with Helen Walker and Murray Douglas at their figgery, Te Mata Figs http://www.tematafigs.co.nz in Hawke’s Bay, before the start of this year’s fig season. A really nice couple, these two, and they deserve all the success that can possibly come their way. Ha! Writing that, I know I’m transparent. Yes, I’m hoping they’ll send me a truckload of their gorgeous figs every year come harvest time! Murray and I had a walk around the figgery while enjoying Helen’s newly developed fig sorbetto with Sketch the family dog in tow. MD “That’s quite normal around here. We’ve some of the best soil in Hawke’s Bay. There are no stones in the soil and it’s beautiful friable, alluvial soil. They used to grow nectarines here, and there were a lot of different fruit trees. We’ve kept some of them in. We use the lemons in the jams and products we make, and now in the sorbetto. Those feijoa trees over there were planted before the figs so they’ve just stayed but the problem is the bees can’t get in to them because we’ve built a netting cage over the whole figgery to keep the birds out, so we don’t get great crops of feijoas. But we get enough for us. And there are Billington plums, too. If at all possible, produce comes from our property. Everything is easy to grow here. Artichokes grow wild, they set seed and away they go. We love their electric bluey-purple flowers. And the taste, of course. “This is our stock plot, where we take our cuttings from. Figs have two crops. A breba crop, which is sitting on last year’s wood, and this winters over, then the new crop, which is on the current year’s growth. We are holding a very big breba crop. It’s normally about 10% of the main crop. The fig grows in the elbow of the leaf and you could say that the leaf feeds that fig, more or less. “This one’s Black Genoa. It’s a curious fig. It has a heavy breba crop and a very heavy main crop, so we get two good crops off this. Further down we have Brunoro Black. 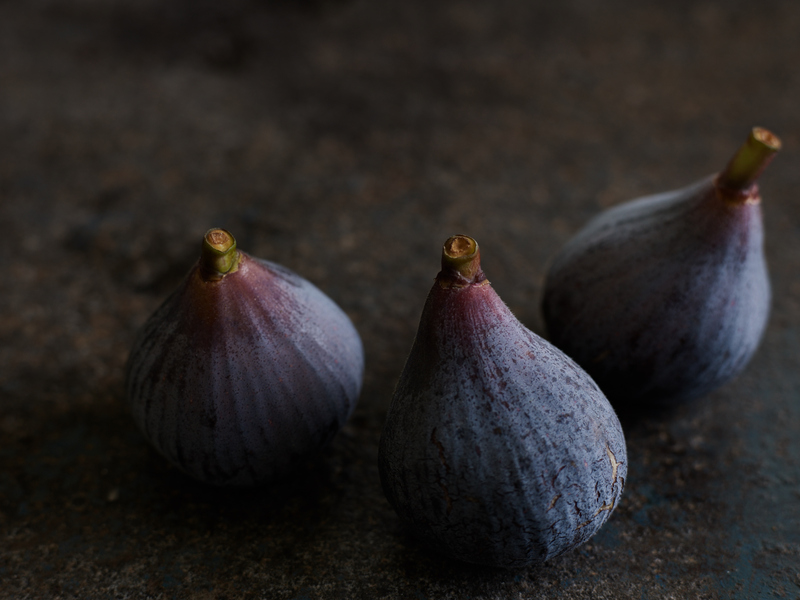 These figs have a lovely shape, so we use them for drunken figs and preserved figs, because they hold their shape and you can get them in a jar. We get three crops in one season from the Brunoros, the third, though, is just a small one in late May. It’s holding a big crop already, and you can see the new fig just starting on the green there. In this case, come late February early March, we’ll have figs there plus the breba crop. “This tree will grow a metre. We’ll clip it when there are about 8 big figs and crop it because we only want 8 big figs, rather than more smaller ones. They’ll be huge, twice the size they are now. What we do as we go around is knock the little buds off because we don’t want them too close together. We keep the buds about 15cm (6”) apart, and let them grow straight up if we can because they get in the way if they go down. They’re easy to knock off at this stage because they’re supple. You can go through later and cut them, but it’s more work. There’s some dieback about. It’ll all be cut back. Soon. You can see how we grow these figs on the horizontal escapalier which gives us a lot of light into the middle of the fig. It needs tidying up now. Another job to do. We’ve had some heavy winds so we haven’t been in the figgery much. It’s damaged parts of the cage, so we’ll need to repair that as well. MD “I’m a great fan of Brunoros, the little Spanish black fig and the Adriatics with the deep red centres because they have so much flavour. 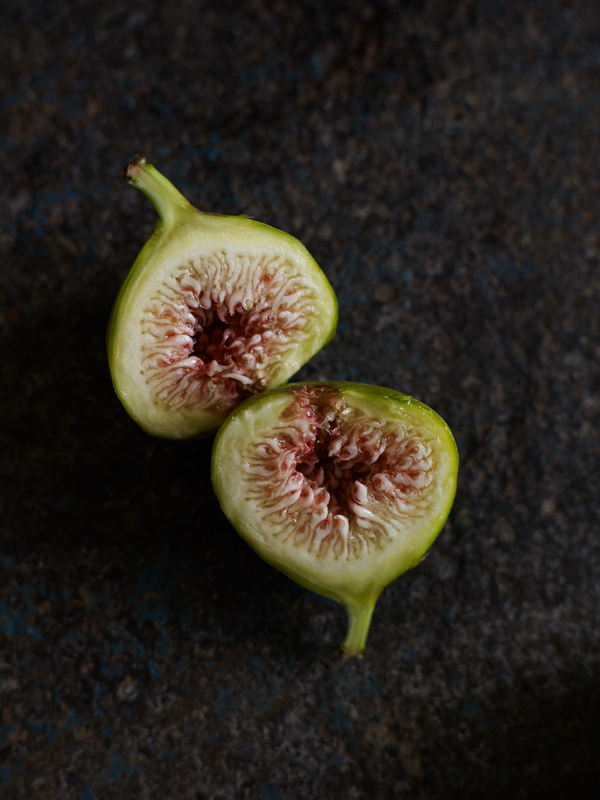 We use pink figs like Mrs Williams in chutneys and syrups and Misa figs, lovely green figs with deep salmon pink inside, in relishes. 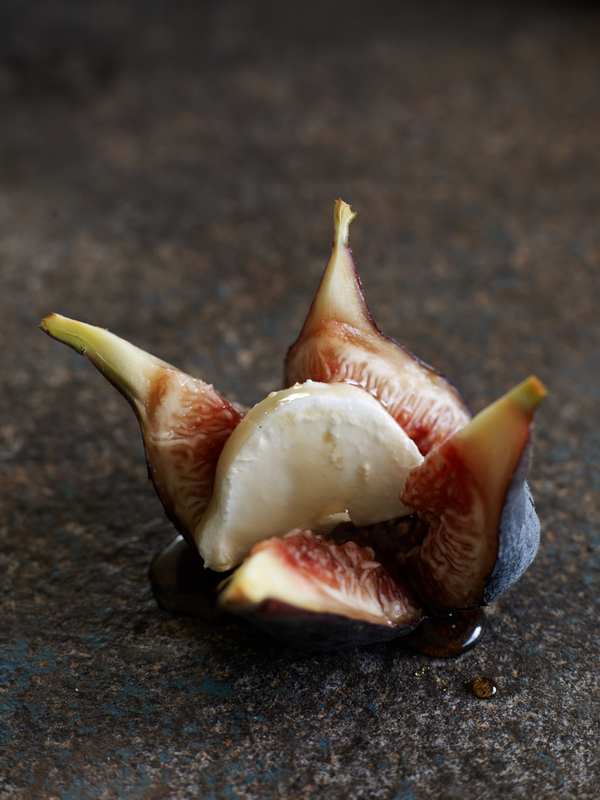 Most figs are just a mass of flowers and when you cut a Misa fig, it opens like a perfect wheel of a flower. In a fig there are 20-40 flowers. It’s like wine; there are different flavours in different figs. “Brown Turkey is like a white fig with amber coloured flesh, but sweet. 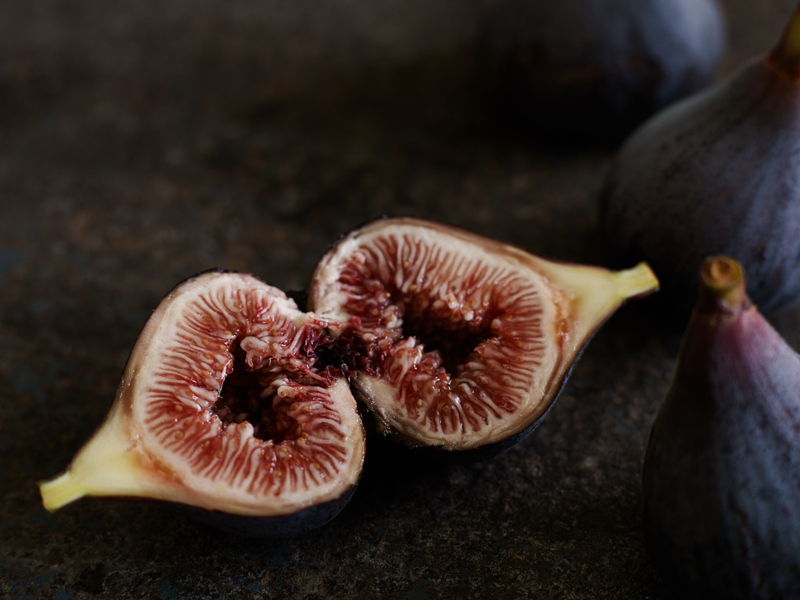 You can put flavour with it when making jams, like orange or ginger, or combine it with rhubarb, but you would never put flavour like that with an Adriatic fig because it’s got its own full flavour. Why would you add more to it? “Cape White’s an early fig. It’s almost pure white inside and has a lovely citrus flavour. Then the Panache fig. I don’t think it has a breba crop but you can see the trunk is striped, the fruit is green and it’ll be yellow and pink inside. It’s pretty, and the Americans love it, but I can’t say I’m thrilled with it. It’s a very late cropper and we don’t always get a crop off it. “The skin on San Piero will go brown and the flesh will be salmon pink inside. Then we’ve got four Brown Turkeys. These are a solid performer, greeny-brown skin and amber flesh. It’s an American name but it was originally a French fig. In fact, I don’t believe the US have a fig of their own. They have hybridised quite a lot – they can get seeds off figs in the US because they have that little wasp there, we don’t have it in New Zealand and Australia. Varieties like Mrs Williams are hybrids. I think they all came in with the Spanish, or in this case, with the French. In the case of New Zealand they were all brought in. There probably won’t be any new ones coming into New Zealand because of quarantine issues. There’s not a huge demand for new figs anyway. It’s a small industry, though hopefully growing, and the figs we’ve got are really nice figs. MD “6-7 years ago. The last 3 years we’ve been making fig products. We semi-dry some, or cut the neck off other fruit and freeze it, then bring it back for jams and sorbetto. We have around 1,000 trees on our property. In all, there are 14 figgeries in Hawke’s Bay and four in the Bay of Plenty associated with, and growing for, Te Mata figs. Other people grow for us so we can produce quite big volumes and we can export, but we still want more. There’s never enough. Helen Walker (HW) “Other fruit vinegars seem to have a huge proportion of vinegar, then sugar added. Our vinegar doesn’t have any added cane sugar. We’ve tried to create products that are unique. I’ve used grape must instead of sugar. I got my hands on some from a local wine grower last season and it sat in the deep freeze for ages, and it’s only now I’ve got the time to start playing. It’s great because it balances out the flavours. They pressed the grapes before the brix level for wine making was reached, so it’s more acidic. It takes me so long to get something where I think it is ready for market. I’ve played with fig vinegar for so long. June to November. We have to do all the development around the edges of our other jobs. The vinegar’s just been bottled. It’s a great colour, a lovely magenta. It’s made with Adriatics, and probably just needs a week or so to mellow before using. But it’s really captured the essence of figs. “Another product is this fig dressing. It’s still trial stuff. I’ve got equal parts of fig vinegar, and the fig meat leftover from making fig vinegar in here, I’m using Adriatic figs which were cooked with spices then sat with grape must for about a fortnight then I’ve just been straining them off today. It’s like making a mayonnaise, adding the oil slowly. Today’s test is looking more like what I am after. So I completely ruined the other batch! This is much better. I’ll put some in a bottle. Try it over char-grilled asparagus, roasted vegetables, salads. If it separates a shake will bring it back. It’s sitting on around 4% acidity, so its got the bite, but smoothness and creaminess from the oil. you could be a great author. I will make sure to bookmark your blog and will eventually come back later in life. My mouth was watering just reading this. I fell in love with figs when I lived in Greece. Now I have a small Brown Turkey Fig growing in a large pot on my deck in Timaru. Each year it rewards me with about 40 figs, I cover it at night during Winter with bubblewrap because the frosts are pretty severe. But it still keeps on going even if it does get a touch of frost. "We are always looking for unusual things, but the samphire was random. A guy just turned up with bags of it. I gave him a coffee, and once I pickled it, I gave him a couple of jars." Oh my goodness, these are the sweetest things, pretty to look at and gorgeous to eat.